The Montessori toddler environment is set up to aid the child in exploration of all aspects of their life. This exciting time in a child’s life requires development of self-care, language (social/emotional) and lots of movement! This is also a time in which many toddlers are away from home for the first time. We believe that creating a warm, home-like environment with nurturing staff will ease the transition for the children thus creating a safe “home away from home” . The toddler environment will be equipped with beautiful and didactic materials that teach the child independence, concentration, and a connection to the outside world. A Montessori toddler environment allows a child to work and explore a material at his pace, allowing for the development of concentration, independence, as well as a sense of pride. Our goal is to actively engage in allowing each child to explore his need for discovery through a safe and beautiful environment while learning how to socially interact in a respectful way with his/her peers and Directress. 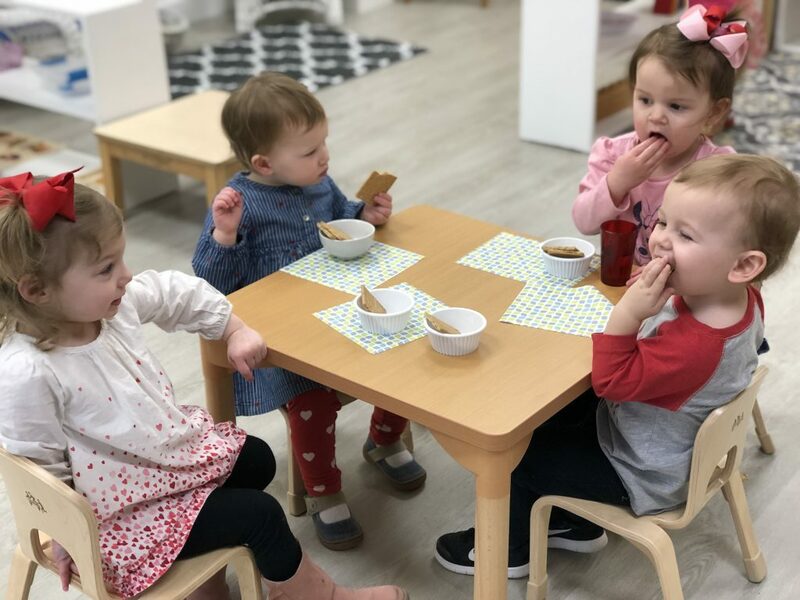 Similar to the Primary Montessori Class (3 to 6 years), the Toddler Montessori Class will be filled with specialized diadatic Montessori materials designed for the child to help in their development. The Toddler Montessori Directress training includes preparation of the Directress, as well as an intensive Infant/Toddler Curriculum. There is a $50 Registration Fee for new students. If a space is available and your child is accepted, you send in the $100.00 fee which will hold a spot for your child for the Toddler class. Trent Toddler will follow the same guidelines as Trent Preschool/Kindergarten with parents supplying their child’s lunch. Those in pull-ups will supply their own pull ups and wipes. Calendar year will follow Trent’s calendar. Two blocks from Trent – St John’s United Church of Christ, Corner of Park Ave & Nelson Place. 18 months to 36 months. Children who turn 3 by August 1st would not be eligible for Trent Toddler as they would be old enough to enter the 3 to 6 class. As children turn 3 years old, and if/when there is an opening at Trent, they would phase into that classroom. 12 children with 2 teachers per class. 6 to 1 ratio. Classroom snacks are provided by Trent. Additional information will be provided. If a child becomes ill during class, they will be removed from the classroom and the parents will be notified immediately. Do not send a child to school when any of the following symptoms are present or have occurred within the past 24 hours. FEVER, SORE THROAT, DIARRHEA, UN-DIAGNOSED RASH, VOMITING, EXCESSIVE COUGHING AND/OR EXCESSIVE NASAL DISCHARGE. If your child becomes sick at school one day or has been sick during the night they should NOT be sent to school on the following day. A 24-hour isolation period should be observed. The child may return to school when the symptoms have completely disappeared and they have been fever free (without mediation) for 24 hours. Only physician prescribed medication is allowed and it must be properly labeled and the Medication Consent Form filled out before it can be administered. $50 Registration Fee per year per student.